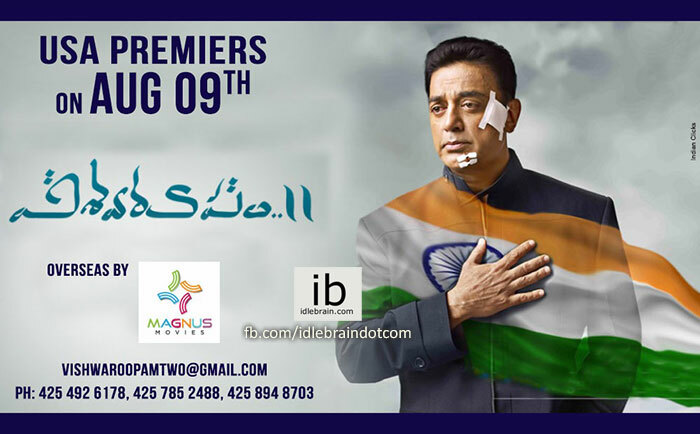 We take immense pleasure to announce that Magnus Movies has acquired the USA theatrical rights of Kamal Haasan's highly-anticipated tri-lingual action spy thriller Vishwaroopam 2 for all three languages: Tamil, Telugu, and Hindi. The USA premieres for the movie have been scheduled for August 9th, on the eve of its worldwide theatrical release on August 10th. Vishwaroopam 2 will be Kamal Haasan's biggest release in the USA, and we are quite excited and upbeat about the film's box-office prospects. The first part, Vishwaroopam, which was mired in controversies back home, was a true-blue blockbuster in the USA in 2013. The Tamil version alone grossed more than $1 million in the stateside, thereby becoming Kamal Haasan's highest-grossing movie there. Now, Kamal Haasan has revealed that Vishwaroopam 2 will be both a sequel and a prequel from the story-telling perspective. The film focus on the backstory of Haasan's character Wisam Ahmed Kashmiri and how RAW recruited him. Directed by Kamal Haasan, the movie also stars Andrea Jeremiah, Rahul Bose, Pooja Kumar, Shekhar Kapur and Jaideep Ahlawat in prominent roles. have worked on the edge-of-the-seat fight sequences.